Happy Monday and happy 2017! Anyone else excited about another day off work? Jordan and I have both been off work since the Friday before Christmas, and it has been so awesome being at home with R and living the stay-at-home life together for a week. The weather has been amazing, and I've taken R to the park 5 days in a row! We went and got donuts together one morning, we've run errands and put away our Christmas stuff and laid around the house doing nothing, and it's just been really nice to not feel for once like I'm rushing from thing to thing. It was the perfect way to end 2016, and I'm very thankful for that time together. 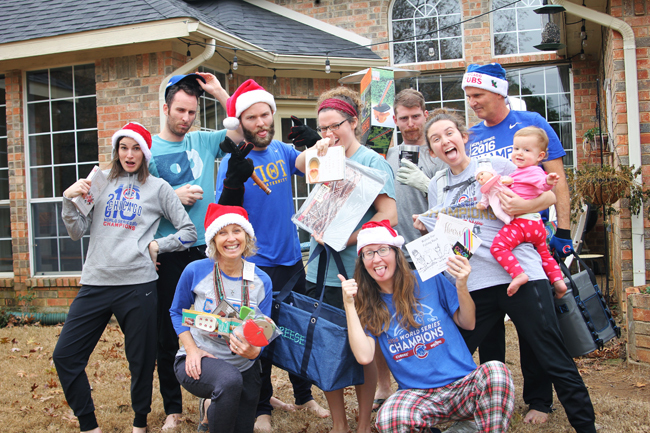 I already shared some pictures from Christmas with R this year, and today for my first post of the new year, I'm recapping Christmas with my family in Texas! On Thursday I have a comparison post reflecting on different areas of my life in 2016 and what I would like to change/adjust/keep the same for 2017, so be sure and come back. You know those moments when you just stop and take it all in? You look around and think how wonderful life is right in that second? I have those a lot when I'm with my family, and this Christmas weekend was no exception. It not always perfect, and we annoy each other just like any other family does, but really and truly these smiles are real. We had such a lovely couple of days in Texas, and even though it was 60 degrees and didn't really feel or look like Christmas outside, it was a very merry time. Every year my mom says she's cutting back and then we wake up to this giant pile of presents. As our family has grown and we've added spouses and now a grandchild, the pile just seems to get bigger and bigger! This year and last year we've done the "want, need, wear, read" categories, so each person gets four presents to open and it's fun to see what everyone got. 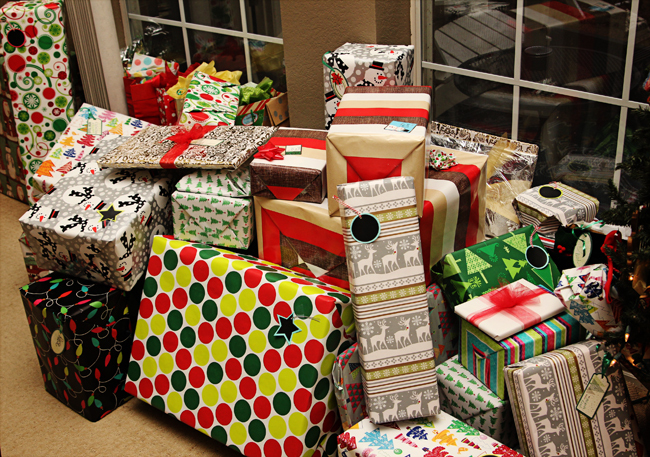 We also draw names so each person has one person to buy a gift for, and we exchange presents the night before. I had my mom this year, an my brother had me! R was spoiled this year and got some fun presents. Jordan and I were surprised how into it she was. Like I said in my last post, it seemed almost like R's first Christmas this year, since last year she was 4 months old and didn't know what was happening. 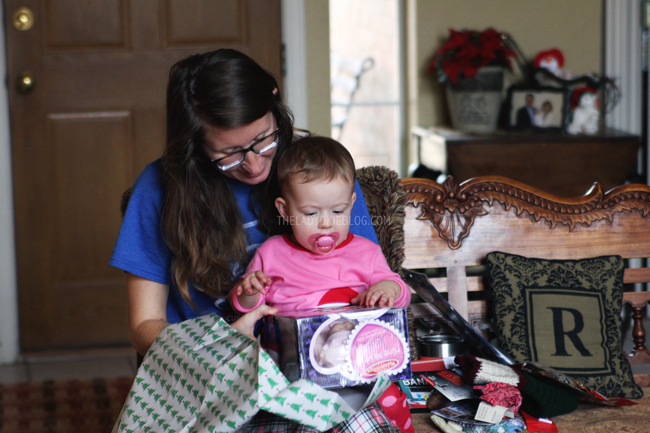 This year she ripped paper and pulled presents out of boxes and she absolutely loved the baby doll my parents got her. It was cracking me up, but she wanted to carry it around the rest of the day and kept feeing the baby its bottle and saying, "ba ba." 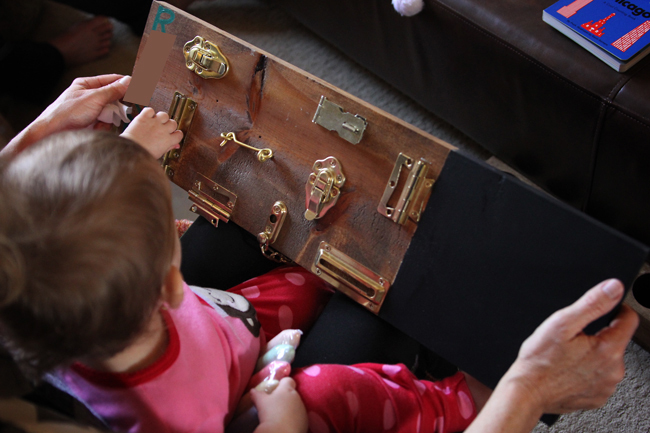 My brother and sister-in-law made R this latch board, which she loved playing with! They painted one end with chalkboard paint, and now she asks me to, "dra dra" all day long. 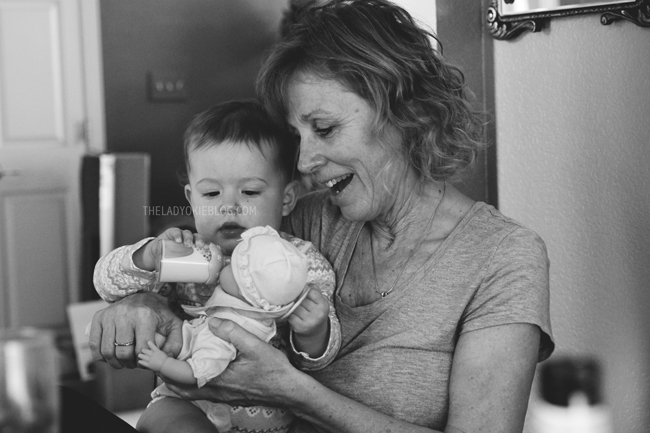 She's holding the baby doll's bottle! Cracks me up. 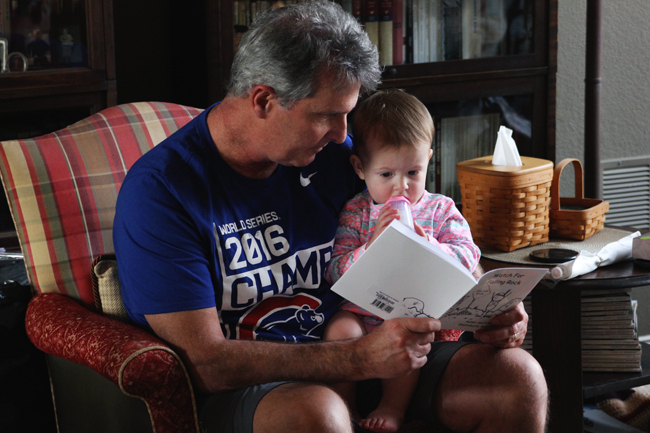 My dad made a very special gift for R this year... he wrote a children's book and had it printed and gave it to her! Since we were little, my dad has told us the story of Falling Rock, which is a story he made up to explain the signs you see along the road that say "watch for falling rock." You might have seen those before too. Well he wrote the story out and I helped him edit it, and he found someone to make illustrations and everything! We all got copies of the book, and it's so fun! 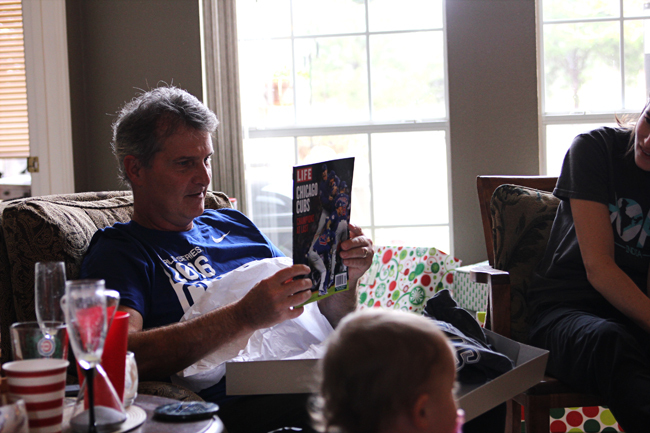 A lot of the gifts this year involved Cubs stuff. Hats and sweatshirts and t-shirts and car decals, and my dad got the Life magazine special Cubs edition. Still celebrating that epic win! 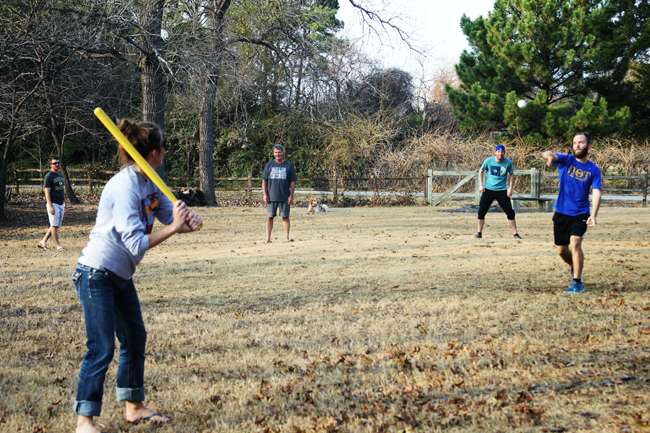 The weather was super nice, so after lunch we headed outside to play some yard games. We played darts (I am terrible) and wiffle ball, and a game I'd never heard of called Molkky. We played Molkky two times, and the first time I lost pretty bad, as I tend to do with anything involving my brothers. Those jerks beat me at everything. So we started the second game, and I was losing bad again. I had 2 points and everyone else had in the 20s or 30s (the winner is the first person to 50, and just to remind you: I had 2). Long story short, I ended up staging a huge comeback and was tied for first with Jordan and my brother--all with 45 points each. I was up next, and if I hit the 5, I would win. Everyone was silent watching as I threw, and I knocked over the 5 and I won! It was super exciting, and I immediately ran a victory lap around the yard. R was very confused by why we were all shouting and clapping. We ate way too much delicious food and Christmas treats, laughed too hard, stayed up too late, and it was all so much fun. 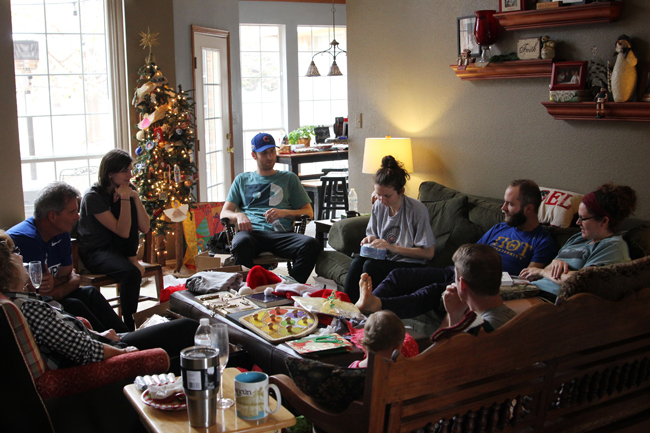 I'm very thankful for a family I enjoy spending time with around the holidays. This year definitely had its low moments, but I feel like we're going out on a high note. 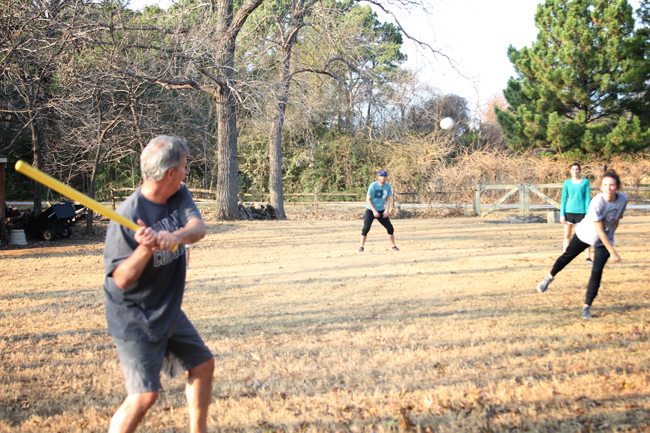 And not even because I finally beat my brothers at an outdoor game involving skill. Ive never heard of that game but sounds so fun. Love those categories for gifts. 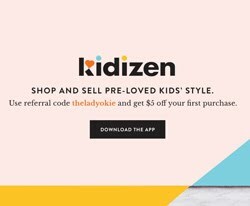 Such a great way to make sure you aren't just getting things to get them. What a fun week though going to the park 5 days in a row! Jealous! Our weather hasn't allowed for that at all, ha. But we did get out yesterday for a walk and it felt so good! That sounds like the perfect Christmas. It's such a blessing to have a family you love to be with. I feel the same way about mine! That is the sweetest gift from your dad! So cool! I've been off since last the Friday before Christmas, and Chris had FOUR days off in a row over Christmas (unheard of) and it seriously makes me want to run away and quit our jobs and just spend every day taking Jack to the park. But, you know, BILLS. Happy new year, friend! Oh my gosh, your family is just adorable! I love that your dad wrote a book for R and all of you got a copy of the childhood story! That's so sweet! 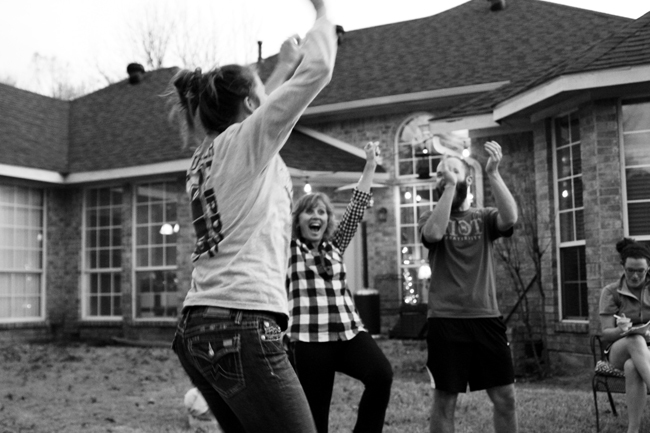 Yard games after celebrating Christmas is so funny to me! It's typically too chilly here to do anything like that (although not always...). I look forward to your annual holding-presents family picture every year. 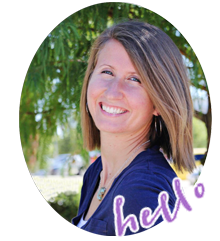 You write so that I feel like I know these people (and I wish I did!) 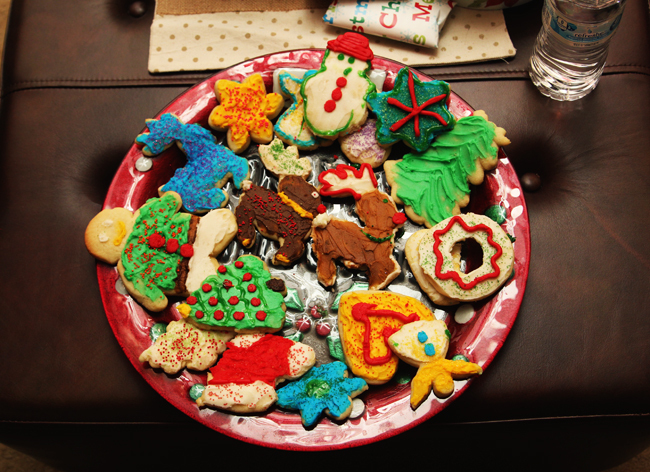 :) I love reading about other family's Christmas traditions. I want to steal them all, especially drawing names for gifts. 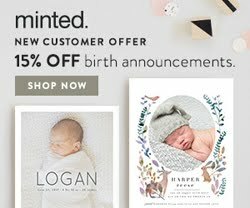 Our family is expanding too and all of that present buying can be stressful (and expensive), especially when you just want to focus on being together for the holidays. Congrats on the win! I have a feeling your brothers will never live that one down. I keep reading recaps of warm Christmas vacations and I'm so jealous! Virginia was fairly cold which meant extra laziness so I'm feeling like a slug. Now that I'm back in California, it's time to get back out there. Your family just sounds like the most fun bunch of people ever :) What a great time of family fun with them! And that is SO cool about your dad creating that book- what a special gift! Your family looks like so much fun! :) I love what you said about those moments where you just sit back and take everything in and think how wonderful life is...that's how I feel too when we're with family. Family is EVERYTHING, and since we live about 5 hours from both sides, it's such a blessing to spend time with them. Life is certainly good when we're with our family, they are priceless moments for sure. I never win outdoor games like that either so I'd have been doing the victory lap just like you did! I love that latch board AND the book your Dad had made! Both are such awesome and special gifts! SO cool about your Dad's little children's story book. That will be a priceless treasure for the family. We've done similar sorts of things over time--I wrote and illustrated a short children's book for my baby sister when I was in college, and I've been involved with writing down and collecting my grandpa's and grandma's oral stories for the family to have preserved as the years go by--I think those are the kind of stories that mean the most! What a fun time with your family! How absolutely amazing that your Dad wrote R a book!!!! That is SO special! I also love that busy board your brother made! I've always wanted one of those for Remi! I've never heard of Molkky, but a huge congrats to you for your major comeback and for beating your brothers!! Epic win! The family picture is awesome. You guys are so fun. Congrats on your epic comeback and victory!